Senior PLO official denies reports that peace negotiators have resigned over Israel's "settlement construction." 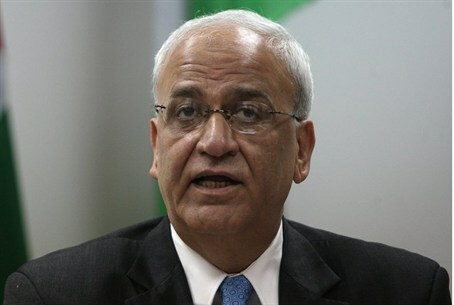 A senior official in the Palestinian Liberation Organization (PLO) denied on Friday reports that peace negotiators Saeb Erekat and Mohammad Shtayyeh had submitted their resignation to Palestinian Authority Chairman Mahmoud Abbas. PLO Executive Committee member Wasel Abu Yousef told the Ma'an news agency that reports of the negotiators resigning were not accurate. On Thursday, sources told Ma'an that Erekat and Shtayyeh had presented their resignation to Abbas, supposedly because of Israel's recent announcement that it would promote 1,500 new homes in the Jerusalem neighborhood of Ramat Shlomo, often erroneously described by anti-Israeli media as an "illegal settlement in east Jerusalem". Informed sources had said that the resignation came in protest of Israel's “non-compliance” with the PA’s demands. A United States government official said Friday that PA officials informed the U.S. of their commitment to negotiations with Israel for the agreed upon timetable of nine months. The PA has been critical of Israel’s announcement that it plans to build in Ramat Shlomo. On Wednesday, a spokesman for Abbas, Nabil Abu Rudeina, said Israel’s move "destroys the peace process and is a message to the international community that Israel is a country that does not respect international law." Responding on Thursday night to reports of the PA team’s resignation, a senior Israeli official said the PA was putting on “a show” in advance of U.S. Secretary of State John Kerry’s visit to the region next week. "The Secretary of State will land in the region next week and the Palestinian Authority is trying to pressure Israel into additional gestures," the official said.